Verotec and mass spectrometry is a great match. Having originally been approached by a major manufacturer of mass spectrometers to replace a previous supplier and manufacture a design to print enclosure, Verotec designed and manufactured a much improved alternative, based on its standard HD167 subrack family. The new application-specific enclosure offers reduced installation time for the housed electronics, improved EMC screening, better thermal management and greater mechanical protection, all achieved at a reduced cost. The unit is at the heart of the mass spectrometer, housing the instrument¹s controller. Given its physical location in an environment subjected to high intensity ionising radiation, EMC screening is a critical requirement to ensure reliable operation. Solid side plates and top and bottom ventilated covers combine an 80% open aperture ratio for ventilation with effective attenuation. The unit is a 6U high, 32HP wide KM6-HD card cage, fitted with 19² mounting angles and configured as four 5HP slots and a single 12HP one. Four different designs of EMC screened front panels and a plain EMC blanking panel are supplied as part of the unit. The backplane, supplied by the customer, is only 1.5mm thick; it mounts as normal on the rear tiebars and it extends below the card cage to give an I/O area fitted with multiple Min D connectors. 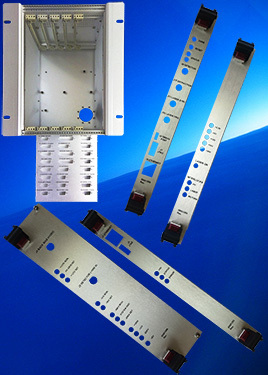 A solid rear cover provides both EMC shielding for the backplane and provides it with mechanical support; an additional separate front cover protects the Min D connectors. Conductive gaskets ensure ground continuity through the unit, the large cable aperture through the rear panel is also fitted with an additional external EMC cover once the cable is installed. Three 80mm top-mounted 80mm intelligent fans provide managed cooling. This project demonstrates the advantages in terms of time, cost and performance of creating a custom design from a standard product platform.